1. The recovery inflatable collar fits for dogs or cats, prevents pets from scratching or biting their injured or rashes area, removing stitches after surgery and neutering, help them recover faster. 2. It is flexible and lightweight, which allows dogs or cats to engage in other activities relatively normally, they can walk freely, eat, drink, sleep and play normally. By the way it will not hurt body like traditional normal E-cone. 3. 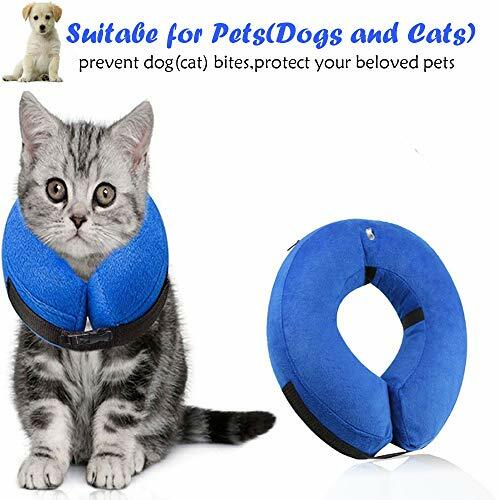 It also great helpful for training purpose, with this cone which efficiently prevents dog to bite other stuff like shoes, pillows, sofa or other furniture etc,it can also use as a soft pillow which make will make your beloved pets sleep well. 1. Insert your pet's recovery inflatable collar through the inner ring loops of the collar. 2. Inflate the collar via air pump tool (pinch & blow) until it feels full, but not hard. 3. Fix the collar on your pets and stick the strap that should be placed at the back of the neck then adjust for a perfect fit. 1. Please measure the neck circumference of your pet and make sure the right circumference of your dog's neck so you can confidently maintain his safety as he heals, It Suitable for most dogs, puppies, cats, kittens, doggies like Labrador, Golden Retriever ect. 2. Always monitor a pet post-surgery to ensure collar is working properly. 3. Designed for pets use only. Not intended to be used as a flotation device. 1. Scratch and Resistant: This inflatable collar will be great helpful to protect your pets from licking or scratching injured area, rashes , surgical site ,removing stitches after surgery, and promote the recovery of wound. 5. Money Back Service: We are dedicated to bring the best user experience, if you have any issue, just contact us. We provide 100% satisfaction guaranteed or your money back service. If you have any questions about this product by Surfei, contact us by completing and submitting the form below. If you are looking for a specif part number, please include it with your message.